Sometimes we talk too much and communicate too little. This is particularly the case in heated exchanges that are fuelled by high emotions, risks, stakes or high levels of uncertainty. Parties become so focused on telling their story that they forget that the purpose of communication is to improve understanding. Sit next to each other, side-by-side. Open a new document in the word processor on your computer or tablet. Then let the other person write everything they want to say. Then… and only then do you go through and make your comments… in writing. Rinse and repeat steps 3 and 4 until you find agreement. I used this approach in a very difficult and heated conversation in the last week. After just two cycles both parties agreed and the emotions completely dissipated? How is this possible? First of all, how often do we – in arguments – get to finish everything we want to say before interrupted? Rarely? Never? Much of the escalation in conflict is directly related to the frustration of not feeling understood. So letting the other party finish talking will go a long way to preventing conflict. Do our words ever come out wrong and we just wish we could stop them mid-air? But by that time it is already too late and we unintentionally created or fuelled the conflict further? Letting the each party carefully choose his or her words on the computer means we remove this unnecessary pollution before it can cause any damage. And who can relate to the urge to interrupt and correct the other party when they say something you disagree with? Our urgency is driven by our fear that a failure to argue now might signal agreement! By instead leaving the words there on the screen in front of you means you have all the time in the world to go back to, and counter each point – if you so desire. And in the argument our main focus is the point(s) of disagreement, so 100% of our focus is on disagreement. What we fail to acknowledge is that we actually do agree on a lot! By instead highlighting all the words in the document that are in agreement we realise just how much agreement there is, and just how small the disagreement is in contrast. Similarly in arguments we often repeat ourselves because we don’t feel understood. On the document we can simplify the interaction by agreeing to delete duplicates. Nothing will be ignored, as everything will be commented on. Finally, when the other person tells you the words, then he or she is the problem. But when you sit side-by-side, looking at the screen together you are collaborators working on a problem; to clean up the words on screen and find agreement. It is now longer “you vs. me” but rather “us vs. the limitations of communication”. Using this process we successfully removed all pollution, reframed all unconstructive language to be constructive, clarified all assumptions/emotions/perceptions, removed all lies/exaggerations, marked all areas of agreement, removed repetition, and in the end there was simply nothing left to disagree on. Which is consistent with the negotiation premise that over 90% of all disagreement is merely caused by a lack of understanding due to inadequate communication. The business owner who had asked me for advice on negotiating the sale of his company was on the right track with his question. Throughout the meeting the owner and his two executives kept fighting for airtime. Not in a rude or aggressive manner. Rather they were simply keen to share their ideas and opinions, and in the process kept cutting each other off. But whenever this happened while I was ta….. …… …… ……. ……… …… ….. …….. ……… ………. ……. ….. …….. …… …….. ……. …… ……… ………. ……….. ……….. ………. …….. ………. ……… ……. ……….. ………….. ….…. ……………. …………. ………… ……..… . ………….. ……….. …………….lking, I would stop mid-sentence. Why? Well, when someone interrupts you they have already made it abundantly clear that their present need is to talk, not listen. So there is little point in engaging in a competition over airtime. What do you get if you win such a competition? Their undivided attention? Unlikely! So when negotiators get interrupted, they stop talking and instead start listening. Whether your boss is spending 90 minutes chewing you out, or your partner is telling you why everything is your fault, or a customer is telling you all the reasons your company is crap, you can also choose to adopt our approach and simply listen. 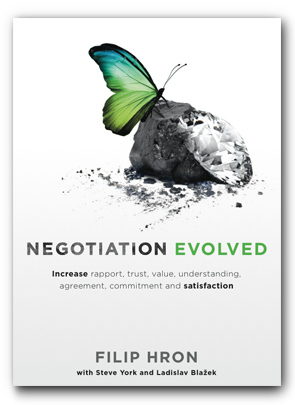 This has several additional benefits for the negotiation process, and you can read further in our book. We don’t understand how influence works. Specifically we assume that we influence by talking. However, negotiators know we influence much more by asking questions and listening. We think we know where the other party is going, or we think they are wrong. Either way we believe they’re wasting our time by continuing talking! However, negotiators know that talking is a need, and depriving the other party of this need is likely to cause resentment, resistance and other forms of pollution. We have things to say of our own, and we want to share them now before we forget. However, negotiators don’t think either/or, but rather both/and. How can both the other party and we get a chance to talk? How about they start, we capture our thoughts on paper, and then we talk after the other party has finished? In negotiation circles listening is commonly referred to as the cheapest concession you can give. So give generously!